"What inspires my style is always the past. I'm pretty sure I live in 1977." Dramatic red lips, tapestry coats, and metallic touches? Hello Glamour! Looks like 2011 is gonna be grand. 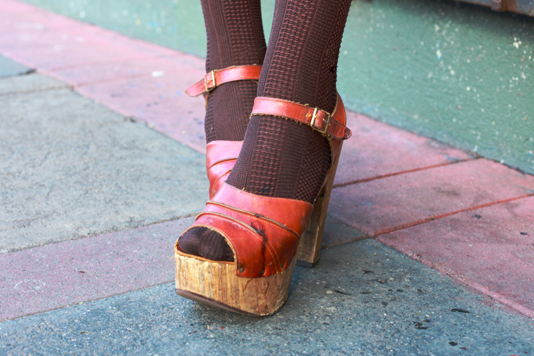 These are the 5-inch platform sandals that those Jeffrey Campbell Two-part Wood Platform Sandals are modeled after. Ginger was impresssively running around the Mission doing errands in these.